A curved display, better animations, and a few advanced tracking features add to its appeal. Microsoft’s new Band curves like a bracelet, arcing over your wrist in a clean plastic line. How the Band slides from one activity to the next has been smoothed out as well, enough to give the Band a slick sheen the first lacked. Microsoft has added a few new capabilities, including a new altitude sensor. Still, the new Band offers feels decidedly iterative, even if the look and feel of Microsoft’s wearable also looks rather futuristic compared to its competition. Some spit and polish will make a difference. The original Band looked like a prototype—utilitarian, and not very comfortable. If Microsoft can convince retailers to display the new Band with the curved screen turned on, I bet that that alone will sell some Bands, but other new features will help, too. A new barometric sensor, for one, allows the new Band to count the number of flights of stairs the user marches up. A new “stairs” icon appears on the default row of icons, and you tap on it to see a stair counter. If you jog or ride a bike, the new Band will actually measure the altitude, rather than map your location against what it knows of that location’s height. The new Band also computes VO2 max, a metric used to measure your peak oxygen uptake—a measure of how fit you are—using the sensors that were also found in the first-generation Band. 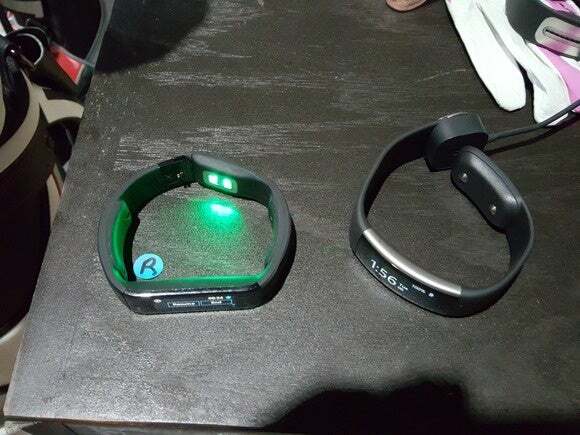 I’d have had to jog a few blocks to test this, and Microsoft wouldn’t let the new Band out of its sight. The first-generation Microsoft Band and the new Microsoft Band 2 (right). Microsoft has also promised new apps for email and texting, as well as updated apps for golf and running. We didn’t have a chance to try these out. I compared the original Band to the new one on both wrists. I like the look of the new Band. 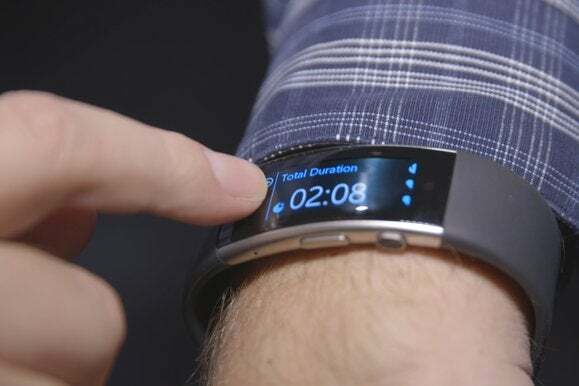 The curved display looks more elegant, and the animations are indeed smoother; These are little things, but they give the new Band an air of professionalism. Some of that huge bezel from the first-gen Band has also been pushed aside. It all looks futuristic. I’m a little concerned, however, that the new, curved Band doesn’t seem all that flexible, so sizing might be more critical than before. That’s a pretty monstrous clasp, too—not enough to bother me for a brief time, but a longer period of use will tell me more. So Microsoft's fitness tracker isn't dead. Where it's going remains an open question, though. “We’re going to publish the SDK again!” chirped one Band exec, evidence that yes, Microsoft still seeks the third-party app development that characterizes smartwatches like the Apple Watch and Android Wear ecosystems. The biggest surprise that’s buried on the apps page is that Uber will soon have an app for the Band. I’m not sold on the future of the Band. I am far more convinced, however, that the Band can be a viable side project for Microsoft, unlike a Fitbit. Maybe it survives until the third iteration, where Microsoft’s “rule of three” suddenly transforms it into a Windows Hello token, for example. Meanwhile, Microsoft’s lab rats will putter quietly away, making it more productive. Let’s see how it all shapes up.